Traditionally speaking floor screed is made from cement and sharp sand mixed together, and you can apply it to a site under construction or on a completed foundation floor. However traditional screed although most common is in fact not the most efficient screed on the market. Which Screed Should You Use? Certain types of screed cannot be used on some floors or in some environments. You need to know what kind of screed will work best for the floor you have in place and the kind of floor you want to have when the screed has been laid. The most common type of screed is cement and sand screed, and this can be used practically anywhere. It takes a long time to dry, but as we mentioned, that process can be hurried up. For most cement and sand screeds, it will take a day for each millimetre the screed is thick to dry. Screed can be as deep as 50 millimetres, which means that screed can take as long as 50 days to fully dry. Different factors affect how quickly the screed dries, and it can take even longer than that in some situations. This one day per millimetre rule is simply a guide and not an absolute that you should expect for every screed application. When you choose the kind of screed you want to use for your floor, you also need to factor in how much screed can be laid each day. Different types of screed can only be applied at a certain rates each day. Otherwise, they will not dry and set properly, leading to an unstable floor. If you use a calcium sulphate screed, for example, you can lay down about 2,000 square metres of screed each day. However, this kind of screed cannot be used with reinforcement, since it will corrode any metal mesh you put with it. It is factors like this that must be accounted for if you are going to have the right kind of screed for your flooring. The kind of screed you choose determines where it can be used, how thick it needs to be and how long it takes to be usable. Bonded screed will be bonded to the substrate using a bonding agent or a primer, and it is great for thin flooring sections that are designed to hold up heavy objects. 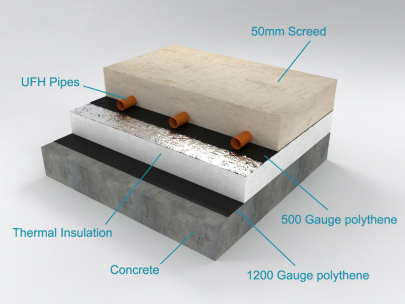 Partially bonded screed is more affordable but is also not as durable. It needs to be at least 50mm deep to ensure it does not break too easily, and it should be laid on a rough slab for best results. Unbonded floor screed will not be directly bonded and is separated by a membrane. This screed levels on its own and is made of sand and cement and sometimes calcium sulphate. 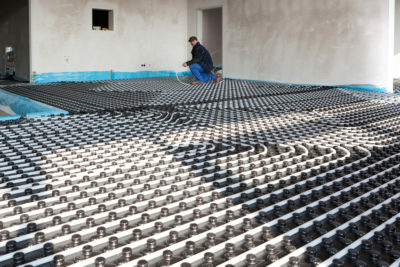 Floating screed is meant to be applied over insulation. It insulates well itself, and it needs to be kept from cracking due to shrinkage with the right kind of insulation or edging foam. Liquid Screeds are an made with specialized characteristics that makes it superior to traditional screed mixes. Fast-drying screed, fast-setting screed which are more expensive than conventional screed mixes however this cost is offset when you consider time and labour costs. By far this is the most superior type of screed because it can handle all situations domestic and commercial traffic. Before you apply any type of screed, it is important to prepare the base. Some types of screed need a rough base to hold them in place, while others will be just fine with a smooth base. You also need to be careful about how deep the base and the screed are. More fragile screed will need to be deep to ensure it does not end up cracking. On the other hand, some of the stronger screed can be incredibly thin and still be perfectly effective. Before applying screed, the base needs to be thoroughly cleaned of any dirt and debris. This will allow the screed to adhere to it better and prevent problems later on. You may also want to consider the noise factor. You can take a look at how to sound proof a floor here. Screed can take a while to set, and the construction crew needs to take that into account. They will not be able to walk on it or work on the floor until the screed has dried and set completely. While some types of screed take longer than others to completely set, the drying process can be sped along without damaging the integrity and durability of the screed. Thats a pretty easy one to answer, Liquid Screed mixes are by far the best in most situations. Particularly in commercial applications where drying time and labour time is reduced considerably.